Russian President Vladimir Putin has dismissed an international investigation into the downing of Malaysian Airliner MH17 over east Ukraine in 2014 as deeply flawed, after investigators concluded Russia's military provided the missile used in the attack that killed all 298 people aboard. Asked about the Joint Investigative Team (JIT) report during a press briefing with visiting French President Emmanuel Macron in St. Petersburg, Putin said that, while he had been too busy to read the report, "I can say right away, even not knowing what's in it." "From the very beginning, we offered to work together on the investigation into the tragedy. To our surprise, they didn't allow us to participate," said the Russian leader. 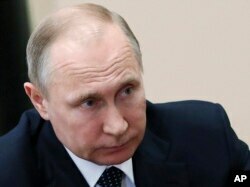 Russian President Vladimir Putin listens during a meeting in Moscow, Russia, April 13, 2018. Putin complained that, while Russia had been excluded from the investigation, neighboring Ukraine was invited to take part. "The Ukrainian side is there, despite the fact that Ukraine violated international law and failed to close its airspace over territory where a military conflict was happening." Putin's comments follow a report by prosecutors from six nations that identified a Russian military unit — the 53rd Anti-Aircraft Brigade in the Russian city of Kursk — as the source of the "Buk" missile that brought down the passenger plane. It also comes amid mounting international pressure for Russia to acknowledge the veracity of the JIT findings. The Netherlands, which lost 193 citizens in the attack, informed Moscow on Friday that it held the Russian state legally responsible and would pursue compensation. Dutch authorities say Australia would pursue similar legal action. The United States, European Union, United Kingdom and NATO have also called on Russia to accept responsibility and fully cooperate with all efforts to establish accountability. Malaysian Airliner MH17 was shot down over territory controlled by pro-Russian separatists in east Ukraine in July, 2014 en route to Kuala Lumpur from Amsterdam. At the time, intense fighting raged between the Ukrainian army and the Moscow-backed separatists. Russia has always denied any involvement in the tragedy and provided a range of theories — since debunked — arguing Ukraine was behind the attack. On Friday, Russia's defense ministry again issued a denial, saying "not a single anti-aircraft missile system" from the Russian Federation had ever crossed the border into Ukraine, despite photographic evidence presented by the JIT investigation to the contrary. Russian Foreign Minister Sergey Lavrov speaks during his meeting with U.N. Special Envoy for Syria Staffan de Mistura in Moscow, Russia, April 20, 2018. 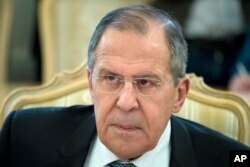 Russian Foreign Minister Sergey Lavrov also dismissed Russian culpability, saying the case resembled accusations against Moscow following the poisoning of former Russian spy Sergei Skripal in the UK. "It looks much like the Skripal affair when they said it was highly likely done by Russians," said Lavrov. The foreign minister then accused western powers of using the tragedy to pursue political goals. Meanwhile, the speaker of Russia's lower house of parliament, Vyacheslav Volodin suggested Russia was already preparing for additional sanctions. While the JIT report places blame squarely on Russia for providing the missile, investigators say they have yet to determine individuals behind the attack.